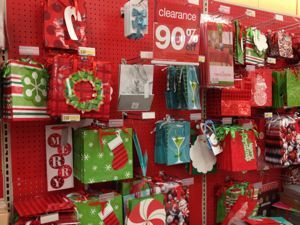 It sounds like many people are finding the Target Christmas clearance finally marked down to 90% off today. I plan to head to my store this morning, I will be sure to post my finds later. If you still see 70% off signs make sure you scan an item or two to see if they have actually moved down to 90% off. Good luck! Would love to post a picture…but am too tired to unload the car and I can’t find those eleves anywhere! Seriously–lots of good stuff…be sure to walk around and especially look by the scanners…found lots of Christmas flannel/fleece in the men’s dept. Vista, CA Target was awesome at 9am this morning-signs said 70 and items rang up at 90. Scored 4 different platters from 19.99-12.99 marked down to 1.99-1.29 and a tablecloth for 1.39, 4 flameless candles for 1.39 each, various gift bags, curling ribbon, bows,and tissue paper for xmas and any other occasion from .20-.30. Used a betty crocker cookie mix coupon on the .20 chocolate mint cookie mix and got them free, ladies’ sleep boxers for .99! The Oceanside, CA one was wiped out by the time I got there about noon: a few broken glass ornaments and some tissue paper was all that was left. It’s such a rush to see “you saved 235.00″ on the bottom of my receipt!! I didn’t make it into the store until about 4pm today and everything was GONE! 🙁 I did score some Milano Peppermint cookies for 29 cents in the grocery section though. They weren’t marked as being on sale but were in holiday packaging. When does target start marking down holiday items?